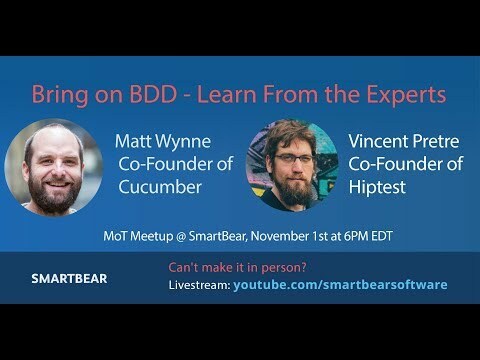 Join our "Bring on BDD - Learn From the Experts" meetup at 6PM EDT on November 1st to hear from Matt Wynne of Cucumber and Vincent Pretre of Hiptest. You can attend in person or via the live stream (more details and live stream info here). For those that can't make it in person, this event will be live streamed beginning at 6:00 PM EDT at https://youtu.be/JyZO-GnpYyI. Uploaded by SmartBear on 2018-11-02.